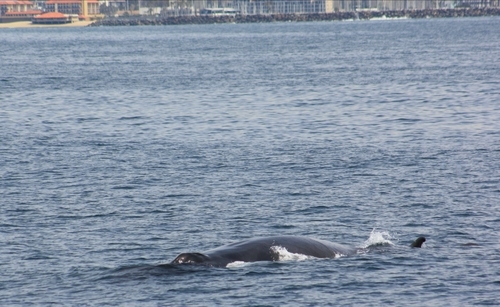 One Northbound Gray Whale was spotted along the Palos Verdes coast today, thanks to the American Cetacean Society - Los Angeles Chapter (ACS/LA) up at Point Vincente! We're still waiting for all those cow/calf pairs to make their way up from Baja - so the next few weeks should be good whale watching! We found 1 Fin Whale and a small pod of Pacific White-sided today. Next trip is at 10am tomorrow so book online at rbwhales.com to reserve your spot! Incredible day with over 3 different Whale species sighted, 2 different types of dolphins and even an elephant seal! We re-located the little Humpback Whale "Spot" while it ventured along the canyon and headed out of the bay. We then found a Northbound migrating Gray Whale that was traveling fast. In the afternoon we found two Fin Whales that were feeding. The water was so clean and clear that we could see the massive pectoral fins underneath the surface. 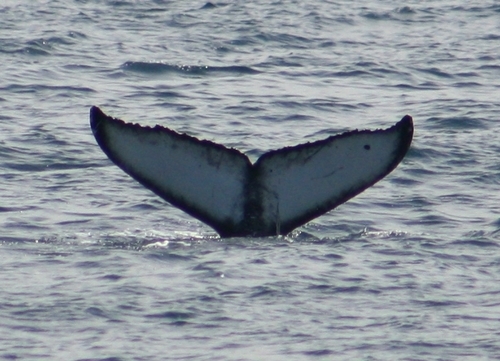 Tomorrow is our last afternoon whale watch of the season! There are a few spots left so don't miss out 🐬 Go to rbwhales.com to get your tickets now! We started off the trip by following the Redondo Canyon and some scattered pods of Common Dolphin. Schools of baitfish were spread throughout the bay. While searching for migrating Gray Whales we found a handful of Bottlenose Dolphins. All dolphins seen today were busy chasing fish, not too interested in bow-riding. We were making our way back to the dock when we noticed a disturbance in the water ahead of us. It turned out to be a very small Humpback Whale calf basking at the surface! While we stopped to watch, it was clear that the calf was resting on it's mother's back. This Cow/Calf pair would spend 5 to 7 minutes underwater, as they milled back and forth.